Euro Steel Buildings – We are the UK's favourite supplier of Galvanized Steel Portal Framed Buildings. Solutions for Agricultural, Industrial, Equestrian & Domestic steel buildings. 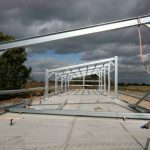 We are a leading supplier of Galvanised Steel, Portal Framed buildings for clients throughout the UK.